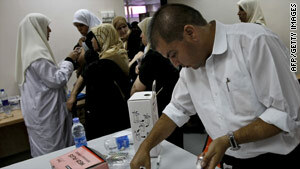 Pilgrims receive the H1N1 flu vaccination as they make their journey to the holy city of Mecca. Health Ministry: "We're confident that it is similar to seasonal flu vaccine and we feel that it is safe"
(CNN) -- Saudi Arabia's health minister was the first person in the country to receive the H1N1 vaccination Saturday in a televised event aimed at calming fears about the safety of the vaccine. After Abdullah Al-Rabeeah got the vaccine, his daughter and several other government officials received it, a spokesman for the Saudi Health Ministry said. The vaccinations became a thorny issue in Saudi Arabia and some neighboring countries after the government strongly recommended the vaccine to people coming to the country for the Hajj, a pilgrimage required of Muslims at least once in their lives. Health officials have been concerned about how to keep the virus, also known as swine flu, from spreading among the millions of visitors expected in Saudi Arabia during this year's Hajj. But some have expressed fears about the vaccination. "I'm being forced to get this shot," said Saher Abu Al-Khair, an Egyptian who is planning a pilgrimage. "And if God wills that I should die as a result, so be it." Saudi's Health Ministry said it hoped televising the health minister rolling up his sleeve for the shot will help calm fears. "I have taken the adjuvant vaccine to tell them that even adjuvant vaccine is safe and I gave it to my daughter in public because we've been studying this for the last few months," the health minister said. "We're confident that it is similar to seasonal flu vaccine and we feel that it is safe." CNN's Mohammed Jamjoom and Ben Wedeman contributed to this report.